Fortunately, Artificial intelligence and deep learning aren’t just popular buzz words. They open up a whole new window of opportunities in the world of GEO data and image processing. In this case, detecting and mapping asbestos in Flanders to be able to establish an asbestos-safe Flanders by 2040. Read more to discover how remote sensing was used in the setup of Actieplan Asbestafbouw. Asbestos was a very popular material in the 20th century. The mineral fiber was used on a large scale in a number of building materials. OVAM has estimated that today about 2.3 million ton of asbestos is still present in Flemish buildings. Fortunately, we’re now much more aware of the Asbestos health risks. In the summer of 2018, the Flemish government decided to start a progressive policy for phasing out asbestos-containing materials in and around buildings. This policy, directed by the Public Waste Agency of Flanders - OVAM, aims to phase out high risk asbestos products such as asbestos cement roofs by 2034 and ultimately to establish an Asbestos-safe Flanders by 2040. In order to establish a well-based and successful new policy, mapping the current situation is essential. Informatie Vlaanderen (IV) and VITO have a long standing cooperation on the exploitation of the BVK (Beeldverwerkingsketen) platform as part of the IV EODaS program (Earth Observation Data Science), which provides geospatial applications and services on large volumes of remote sensing data of Flanders. Very high resolution aerial imagery contains area-wide information of all building infrastructure. However, finding links between imagery and the Asbestos content of roof materials is quite challenging. To scan multiple data sets of Flanders and detect asbestos-containing materials in and around buildings we used Artificial Intelligence techniques. 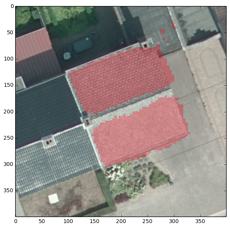 Together with OVAM and Informatie Vlaanderen we developed new deep learning techniques and processing workflows to detect all potential locations where Asbestos might be present in the rooftop materials. 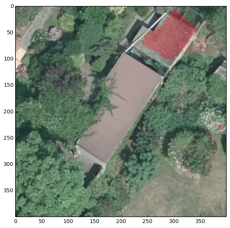 Detecting (transparent red) potential rooftop materials where asbestos might be present by using the AI algorithm. Asbestos isn’t visible with the naked eye which means we actually don’t know if our building contains asbestos containing materials. Therefore it is even more important to inform and engage our Flemish population to make Flanders asbestos-safe. 27.2 million euro in 2018 and 2019 to make Flanders asbestos safe by 2040. This new technology allows us to inform and engage the citizens in asbestos removal campaigns. 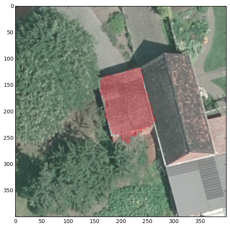 By combining the Solar Map and current records about asbestos in Flanders, we can consult on the locations where asbestos removal followed by the installation of solar panels are profitable. Everything starts with detecting and mapping asbestos in Flanders. Thanks to artificial Intelligence and deep learning techniques we are able to facilitate this process. The ultimate goal in this process is to detect asbestos-containing materials in and around buildings built in Flanders before 2001. This inventory will gives us better insights on the situation and indicate where actions are needed.